Events Update, and New Pictures! This whole weekend is going to be a lot of fun, and I am going to all of the events, culminating in the market on the Sunday. I should be trading alongside some friends (more on that later!) so you should come down and check it out. 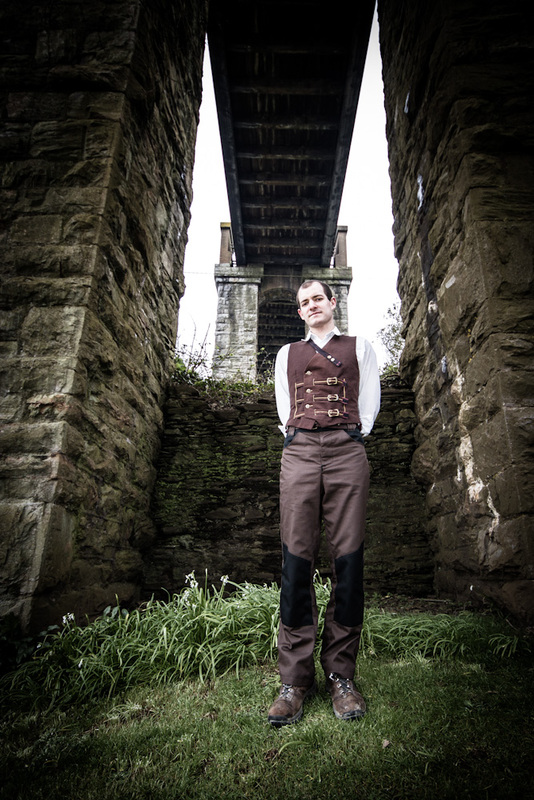 Who knew that there’d be a steampunk festival one town down the coast from me in Cornwall? Well, I didn’t. But there is! It’s call SinS, and I should really know what that stands for! I’ll be catching the bus at some ungodly hour in the morning, having only just got back from SinS, up to London, to trade at the London Fetish Fair. A little edgier than the others? Maybe so, but it’s lots of fun, and there’s nowhere better to see incredible outfits! This looks like it’s going to be a good one! People are coming from far and wide for the inaugural event, and we wouldn’t miss it! Check it out here. The day after that, I have an olympic distance Triathlon. It’s going to be a fun month! Now, new pictures! Generations ago, I made the Airshipman’s Jeans. The original ones weren’t very good, and nor were the photos I had of them. So I’ve reinvented them, changed the design somewhat, and finally got some nice pictures! I think they look pretty sweet, and mine are getting a lot of wear- I used polycotton rather than pure cotton in an attempt to make them more hardwearing and more washable, and it’s worked well. These should last for years! This photo was taken underneath Brunel's Royal Albert Bridge in Saltash. It doesn't get more steamy than that! You may have noticed that I’ve been making a bunch of steampunk stuff lately. If you haven’t noticed, go and notice! I’ll wait. The reason for the slightly soft focus on this shot is that Tom shot it on a 1947 Kodak Box Brownie. The man is dedicated. Done? Good. 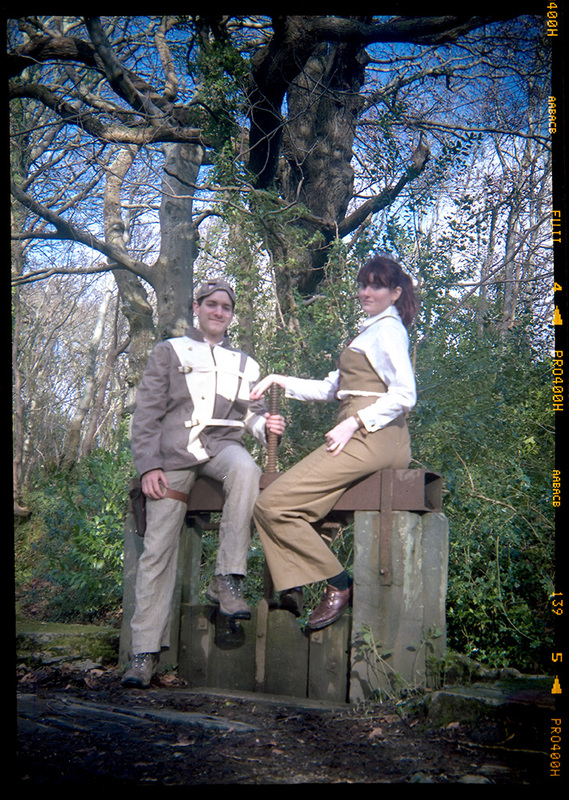 Steampunk as a subculture is on the rise at the moment, and there are events springing up all over the place! In the merry month of may, I have two events. Allow me to give you the details (or “deets”, as I believe the kids are saying). The first, on May 11th, is called SinS, and is deliciously local to me- it’s just down the coast near Looe. There’s an event on Facebook HERE and a website HERE and also you can click HERE to get free cookies. I’m just kidding. There’s no such thing as a free lunch. Anyway, I’m really excited about this event! Partly because it’s so close to me, and partly because it’s so close to the sea, and I love the sea. Good old sea. Also, by May it’s going to be gloriously sunny every day! The second event is the weekend after, on May 18th. It’s the Market of Curiosities at the Frome Steampunk Extravaganza! I’ll be honest- I’d never heard of Frome before I heard of this event. Now I have, and my life is the richer! It looks like it’s going to be quite something! So to sum up, that’s SinS one weekend, then Frome, then the next day I have a triathlon. Good times!